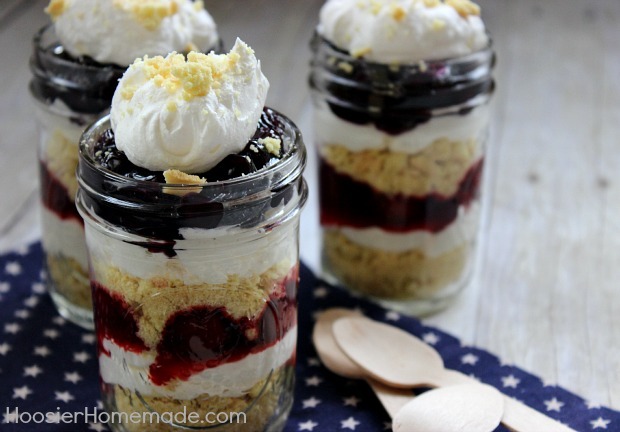 No Bake Cheesecake Trifles – This recipe from Hoosier Homemade looks decadent, but only requires 6 ingredients, and did we mention NO BAKING. Which is perfect since the 4th doesn’t fall on a weekend. 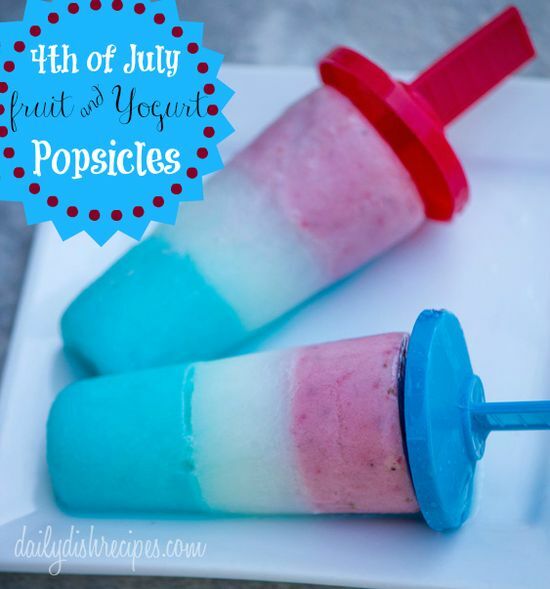 Fourth of July Fruit & Yogurt Popsicles – Who doesn’t love popsicles in the summertime? The perfect refreshing treat for any summer afternoon, but with this color combo these popsicles are perfect for the 4th! 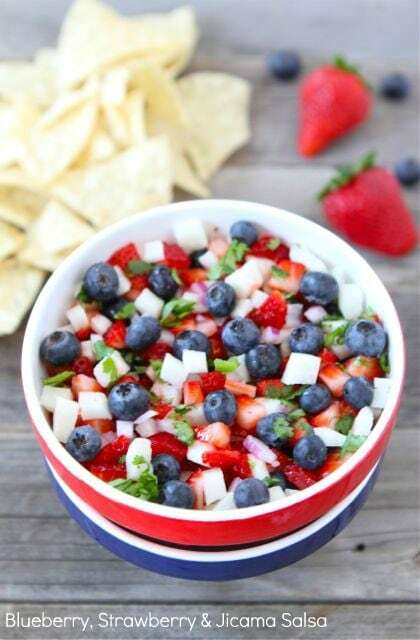 Blueberry, Strawberry & Jicama Salsa – How beautiful is this salsa? Great with regular tortilla chips or cinnamon sugar pita chips, this salsa from Two Peas & Their Pod won’t disappoint. How does your family celebrate the 4th of July? Be Square On Your Birthday: 3 Sweet Bar Recipes! Being square isn’t always a bad thing. We think these three square treats are perfect for your next birthday bash. They are pretty simple to make, pretty tasty, and well very pretty to look at! 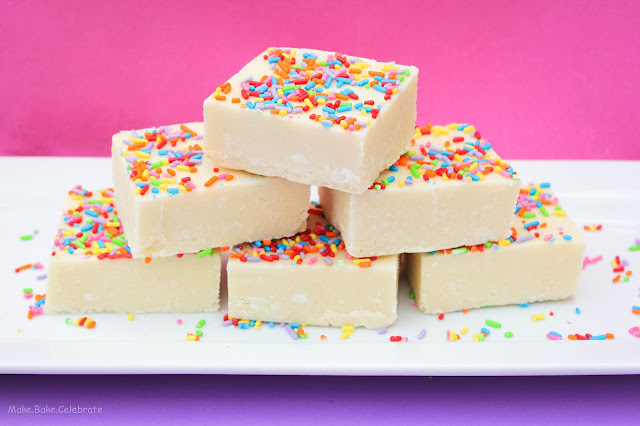 Birthday Cake Fudge – Can you say decadence? The richness of fudge might make it not ideal most of the year… but come on it’s your birthday, live a little! This recipe comes from Make Bake Celebrate, a wonderful baking blog worth checking out. 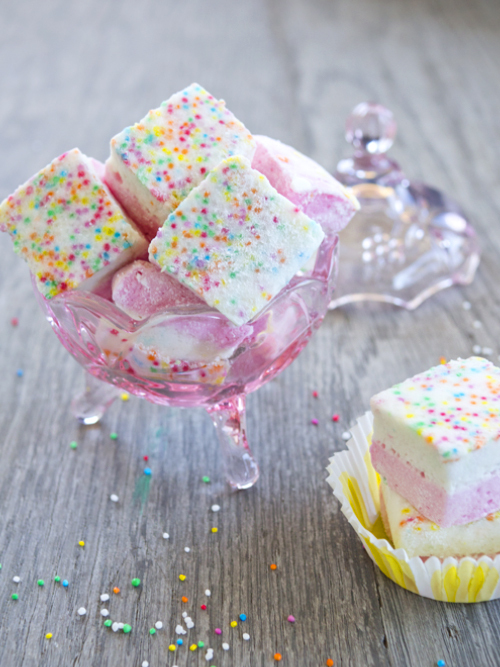 Birthday Cake Marshmallows – How adorable are these fluffy squares of sweetness? This recipe comes from Spicy Icecream, and is not too tricky! Definitely worth a try. Birthday Cake 7 Layer Bars – can’t decide on just one sweet indulgence? No problem go with a seven layer bar! This awesome recipe by The Domestic Rebel combines Funfetti cake, chocolate chips, marshmallow, cupcake bites, and two kinds of oreos! What is your favorite bar shaped sweet treat? 3 Gluten Free Party Perfect Treats! We know we said these recipes are perfect for parties, but honestly they are simple enough to whip up for an afternoon snack or weekend treat. These recipes are sweet twists on traditionally savory treats. So make any day feel like a party, and whip up one of these sweet treats that are great for sensitive tummies! Gluten Free Almond Butter & Banana Quesadilla – This recipe from With Style & Grace promises to knock your socks off… and we don’t doubt it. Who doesn’t love the classic combination of nut butter with bananas? And if nut allergies cause you troubles, why not try a soy nut butter or apple butter? Want another way to really amp it up? Drizzle a little honey or agave on the inside for an extra decadent kick. You won’t regret it! Gluten Free Almond Butter & Banana Quesadilla – Image & Recipe from With Style & Grace. Gluten Free Brownie & Berries Pizza – This recipe from Betty Crocker is super easy to whip up since it uses a mix, but is sure to make you look like you spent hours in the kitchen. Who doesn’t love cookie or brownie cakes? If you don’t want to use Betty Crocker GF Brownie Mix you could always swap it out for your favorite organic or natural brand… or use your favorite from scratch recipe. We also think you could swap out berries for a cherry pie type filling for a tasty alternative! 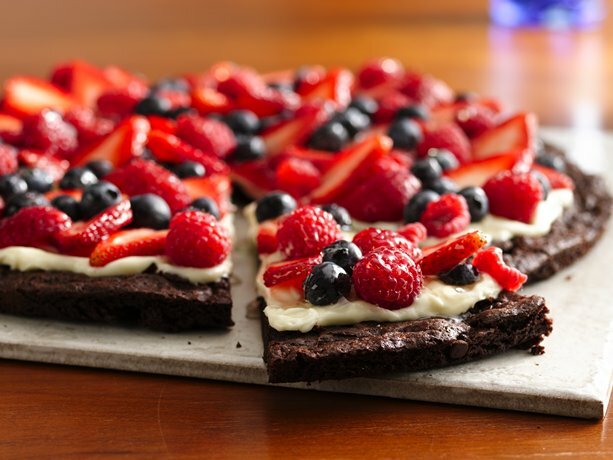 Gluten Free Brownie & Berry Pizza – Image & Recipe from Betty Crocker. Gluten Free Pumpkin Empanadas – Yum! We love pumpkin, even though Fall is passed. This simple recipe from Simply Gluten Free makes 12 tasty dessert empanadas 🙂 How adorable are these? It would be so easy to swap out the filling for warm apples, cherries, or even a sweet cinnamon & cream cheese filling! 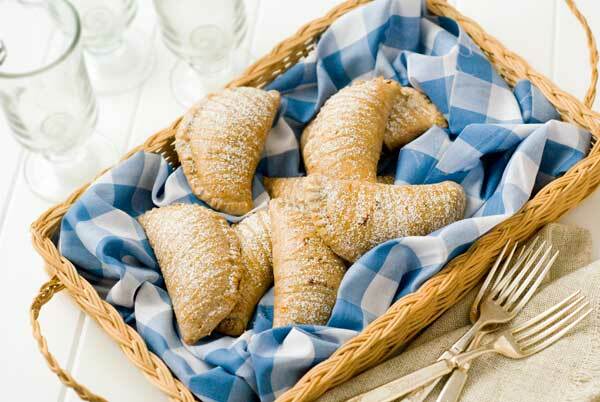 Gluten Free Pumpkin Empanadas – Image & Recipe from Simply Gluten Free. Hope you enjoyed these seriously fun, seriously delicious, and seriously gluten free treats! And even if you aren’t sensitive to gluten we still think these recipes are worth a try. Let us know your thoughts! Preheat the oven to 350 F. Grease the muffin pan with vegan cooking spray or butter or line with cupcake liners. In a bowl mash the bananas well. Then add the additional wet ingredients from the apple sauce through vanilla extract. In a separate bowl combine the dry ingredients from the flour through the sugar and mix well. Slowly stir together the wet and dry ingredients until well blended. Then add the apple cider vinegar. Spoon the batter into the muffin cups about 1/3 of the way full. Bake 22-25 minutes in preheated oven or until an inserted toothpick comes out clean. 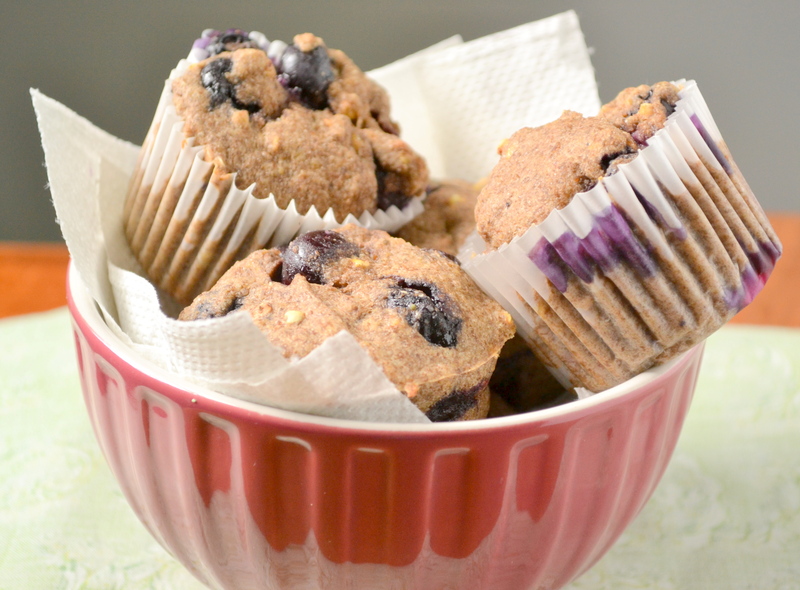 These muffins are tasty and healthy. A great snack or breakfast to keep around the house, and perfect for sharing with friends. Have a happy Tuesday! What are your favorite kind of muffins? 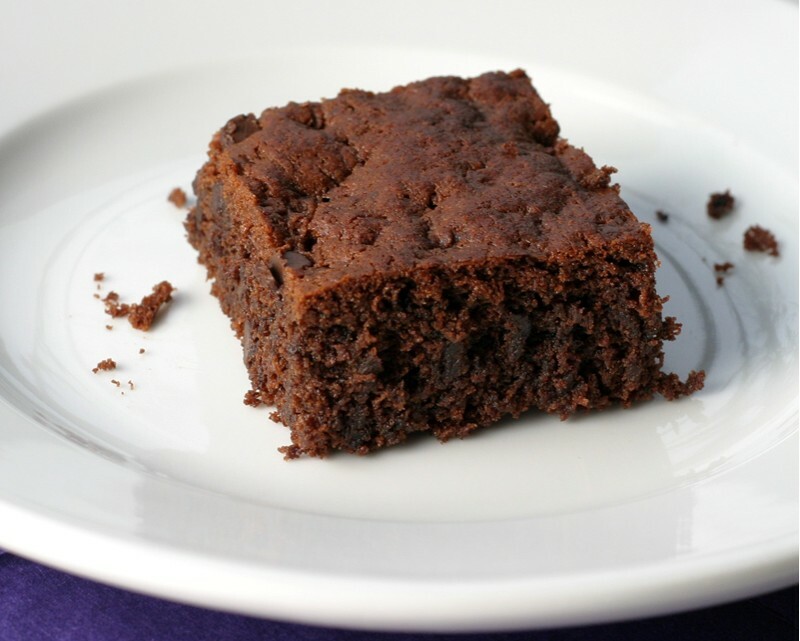 Today we’ve got a recipe for delicious, cakey gluten-free brownies adapted from the book Gluten Free Baking Classics! These are so tasty nobody will even notice they don’t contain any wheat. We whipped up a batch of these for a joint birthday party this past weekend (but forgot to snap pictures), and they were a hit. These are great for birthday parties, pot lucks, or the holidays. You can add mix-ins according to your preferences. Chopped walnuts, chocolate chips, or caramel sauce make nice additions! Oh and did we mention we seriously cut the sugar on these too by using stevia in place of sugar. Optional: 3/4 cup chopped walnuts, or chocolate chips, or dried fruit, or a combination. Preheat oven to 325 degrees Farenheit, 350 if you are at altitude. Position rack in lower-middle oven, and grease an 8-inch square pan. Mix flour, salt, baking powder, and xanthan gum in a bowl, then set aside. Over low heat, melt chocolate and butter in a heavy sauce pan. Once melted, remove the pan from heat and whisk in stevia and vanilla. Whisk in eggs, one at a time until mixture becomes smooth and glossy.Add the flour mixture and whisk until incorporated. If you are adding nuts or chocolate chips add them and stir to combine. Pour batter into prepared 8-inch square pan and place in the oven for about 45 minutes or until a toothpick inserted in the center comes out clean. Allow the brownies to cool completely, then cut & serve! What is your favorite brownie recipe? And do you like dense or cakey brownies? We can’t make up our minds. Want to stay updated on what we're doing?